Just look to the old New England stone walls that we see along many of our country roads or in the woods. They give us a strong connection to our past. The old walls supporting our dams and railroad right-of-ways for 150+ years are still impressive and very beautiful. What about today’s landscape walls? At Natural Path Landscaping, we usually build landscape walls either with interlocking, concrete blocks to form Segmental Retaining Walls (SRW), or we build them with rock. We advise that poured concrete walls are too harsh, and pressure-treated timber walls are too temporary. Interlocking concrete Segmental Retaining Walls are very strong and last a long, long time if properly constructed. They can also be very attractive if a high end interlocking concrete product is chosen and the wall has a pleasing design. We do not recommend Segmental Retaining Walls for historic properties, however, since they have no resemblance to anything that might have been built 100+ years ago. Dry rock wall was constructed to cover previous concrete wall and provides the perfect outdoor setting for this home built in the early 1800's. This rock wall built “dry” without mortar or concrete, using angular granite rocks, resembles the quarried walls of long ago. Segmental Retaining Walls made with strong, interlocking, segmental concrete blocks, replace timber walls with great results. 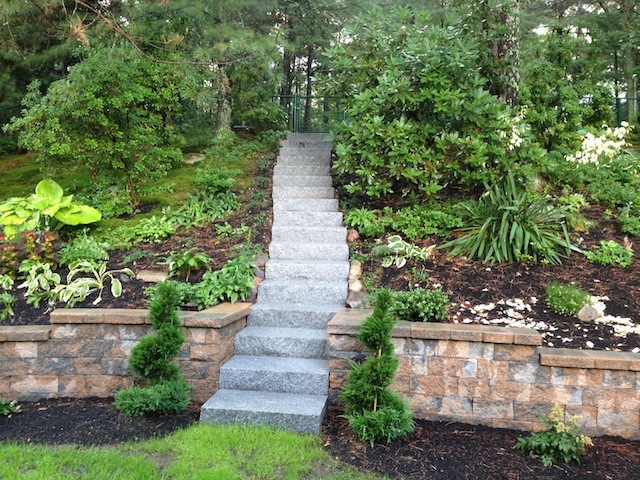 We recently completed a replacement of a large retaining wall and stairs for the entrance of our home. The project from start to finish was excellent. Tom and his team did a great job in terms of the construction and design work. They put in some very long (hot) days and the wall looks great. It is often the ‘little things’ that make a job go well and Tom is very good at them. Examples are 1) the upfront planning, drawings and contracting such that the layout of each stone in the walkway was determined before the first shovel hit the ground, 2) the work area was cleaned each day, 3) he provided very good ideas throughout, 4) was open to our ideas and found a way to integrate, 5) worked well and proactively with other service providers involved in the project, 6) communicated throughout in terms of status updates and the next steps, 7) was flexible as we asked for little changes here and there. 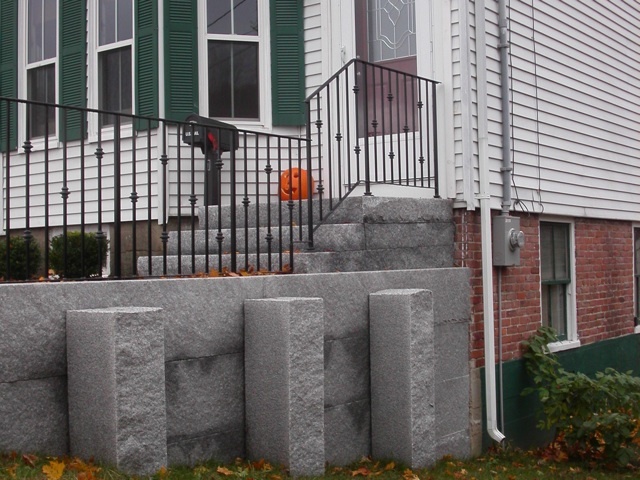 Granite curbing stacked and pinned with granite posts provides an exceptionally strong and unique wall. Granite steps were used instead of building the steps from wall blocks. Note how symmetrical the wall looks relative to the steps in spite of the steeply sloping driveway. Back yard is terraced to provide sitting area, with rock walls that taper into the hillside. Terraced, curving wall with penetrating granite steps. Long 5' high wall supports back yard. 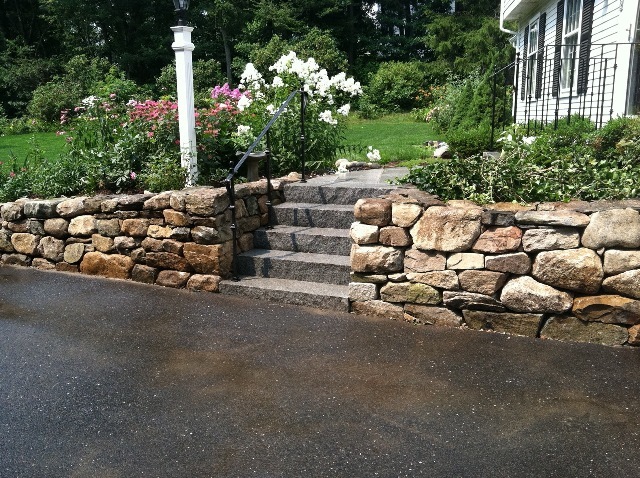 New England fieldstone wall with penetrating granite steps. 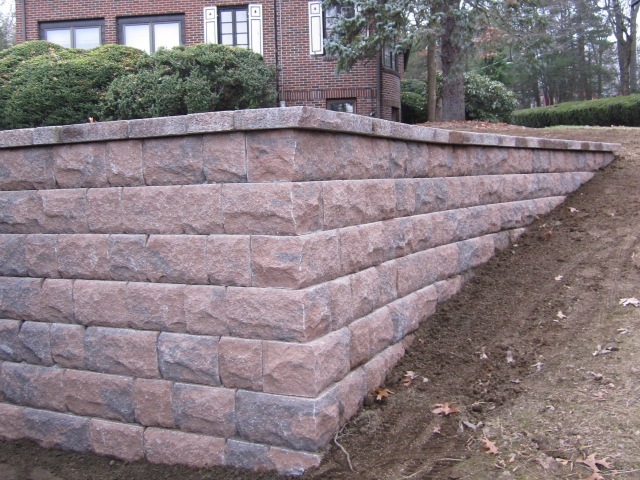 Formal rock wall with 2" thick by 20" wide granite cap. Dry rock walls hold back gardens. 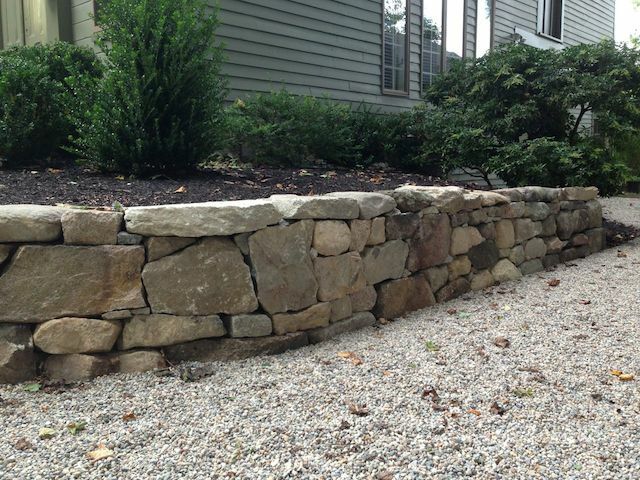 A dry-laid New England fieldstone rock wall is functional and also becomes a focal point. This wall replaced a rotting, pressure treated wooden wall. 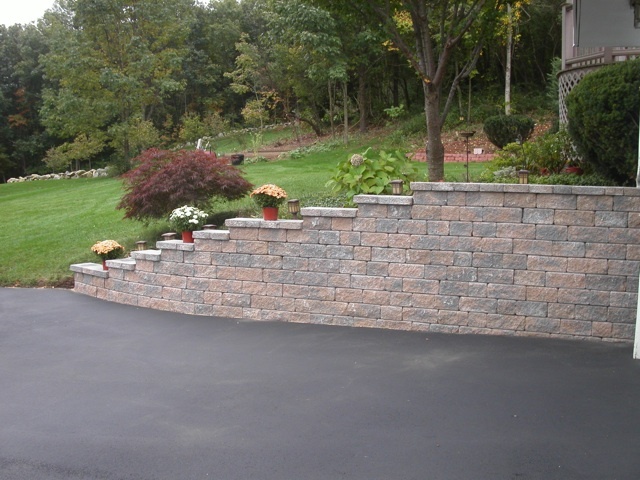 This Goshen Stone wall supports a brick patio raised with granite curbing. Low rock wall borders raised patio. On this slope, a curved wall creates a garden terrace. A rebuilt barn foundation provides a sunken grass patio and garden area. Huge rocks along the top of this patio wall make it a perfect “sitting wall” overlooking the golf course. Gorgeous boulder wall turns an ordinary slope into a lovely garden. 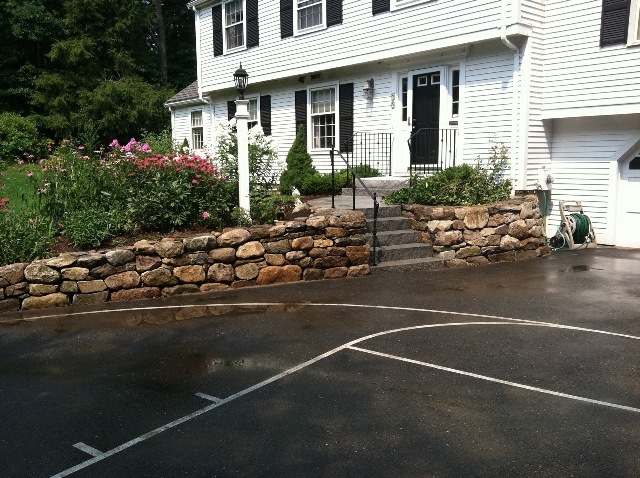 Fieldstone wall incorporates granite steps and a lamppost on the far side. This large Saratoga granite rock wall has a 4" thick cap that is 2' wide to fit its mass.